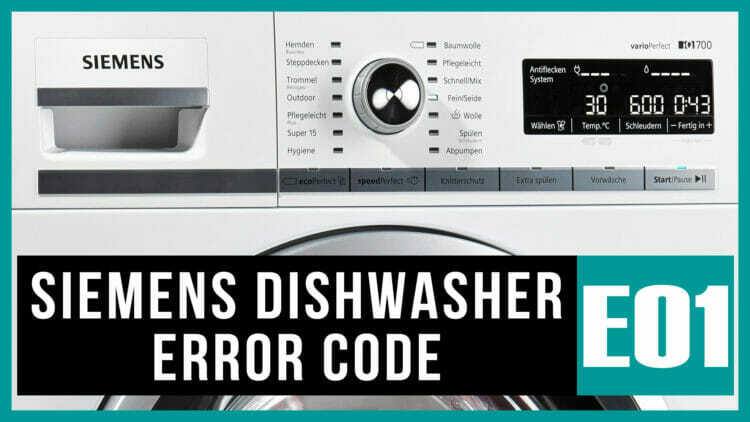 If the E01 error code appears on the Siemens dishwasher display, don’t panic. This way the equipment reports the failure of the heating element. You can easily eliminate this breakdown without the help of a master. In addition, besides issuing the error code on the display, you may notice poor water heating. In some cases, the washing process stops, too. burnout of the heater. Most often, the reason for this is the excessive hardness of the tap water. That’s why scum accumulates on the element surface. Before repair work, experts recommend checking the heater. The complexity of this task lies in the next fact about Siemens dishwashers. They are equipped with a one-piece sidewall with the heating element and a hose and nozzle outlet. If there are no screws in the dishwasher model, disassembly of the unit is not possible. Therefore, a user has to provide a complete replacement of the unit. How to fix the E01 error in Siemens dishwasher? if the fault appears, you can start checking the heater. The heating elements of Siemens dishwashers are quite expensive parts. Therefore, it is worthwhile to verify the heater failure, and only after that provide the replacement. After that, proceed to the heater replacing. Perform all the actions in reverse order. Now it is clear why the Siemens dishwasher issues the E01 fault. You can find the reason and troubleshoot it without any help. The main thing is consistency and accuracy of actions.